Lots Of Questions Still Concerning Our Weekend Storm. 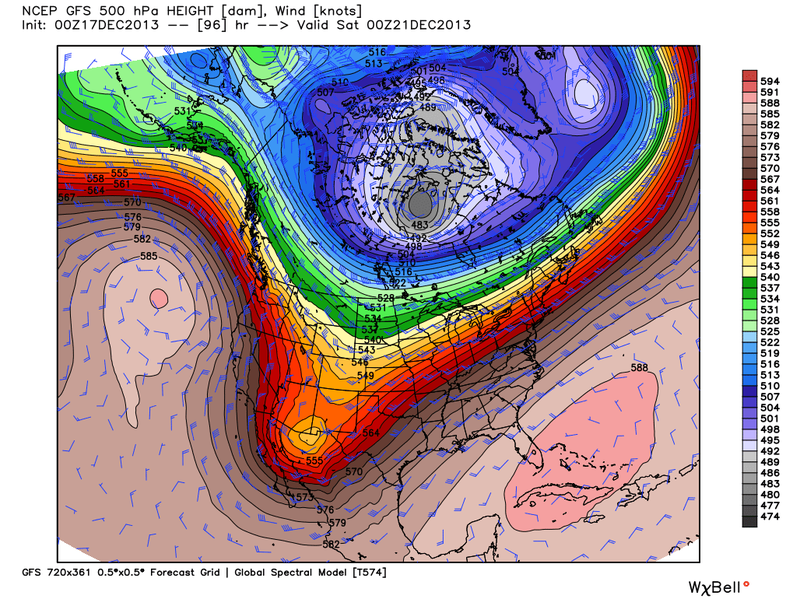 Blog Updated 6:30 AM MST Wednesday, Dec 18, 2013. Artesia, New Mexico 12-8-2013. Courtesy Of Amanda Malone. 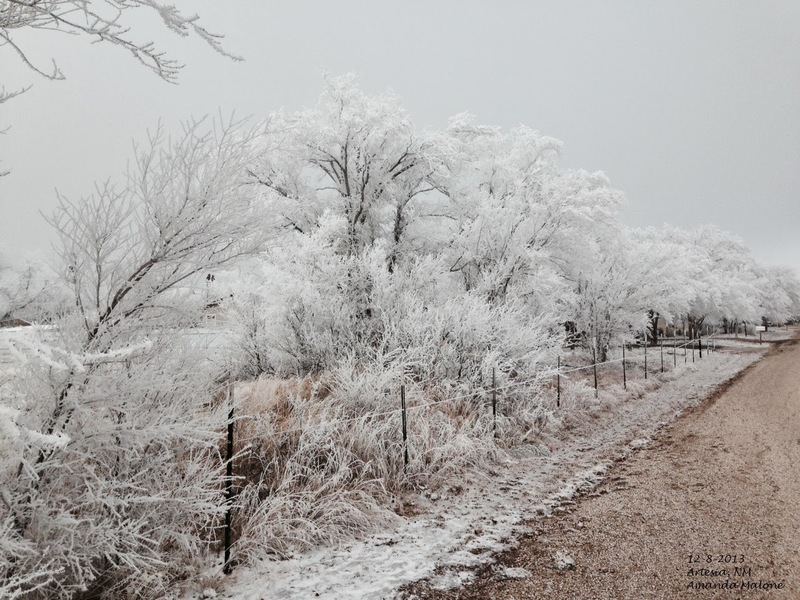 Ice storms are relatively rare in southeastern New Mexico. I missed this last one since I was in Boston, MA with my family visiting relatives. My oldest daughter captured the photo above. Temperature Average (C) Dec 1st - Dec 17th, 2013. 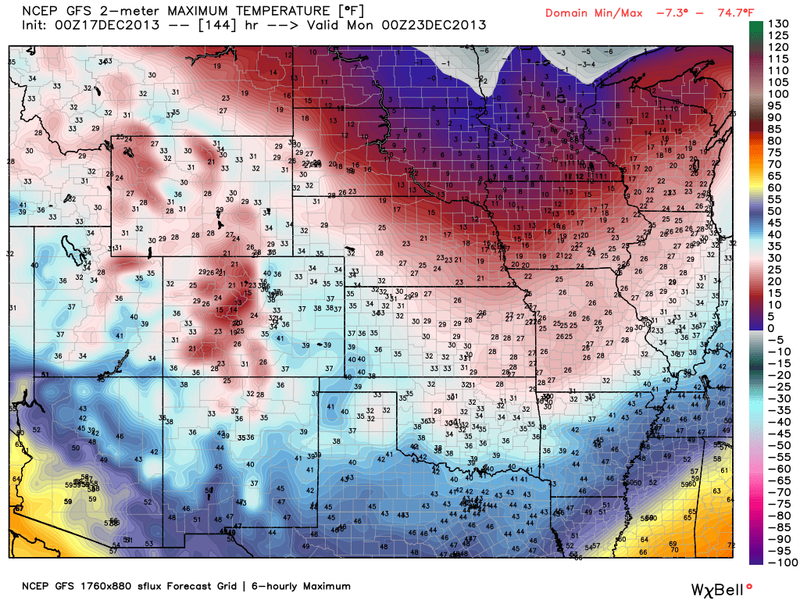 New Daily Low Max Temperatures 1,274 & 285 tied. New Daily Low Temperatures 762 & 195 Tied. New Daily Snowfall Records 704 & 107 Tied. New Monthly Snowfall Records 31 & 5 Tied. 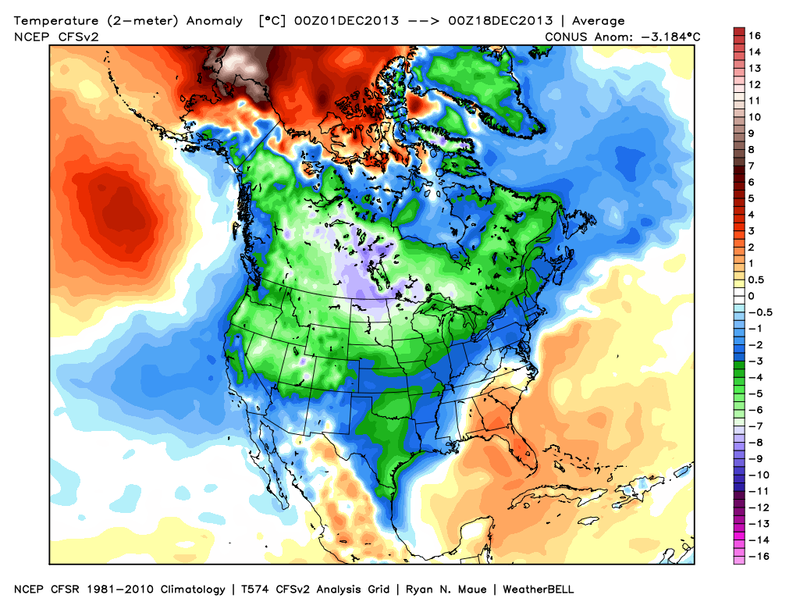 New Monthly Low Max Temperatures 3 & 4 Tied. New Monthly Low Temperatures 2 & 2 Tied. So far this month (as of the 15th) there have been 1,559 New Daily Low Max Temperature Records set or tied. There have been 957 New Daily Low Temperature Records set of tied. 811 New Daily Snowfall Records have been set or tied. 26 Monthly Snowfall Records have been set or tied. 7 New Monthly Low Max Temperature Records have been set or tied. And 4 New Low Temperature Records that have been set or tied. For a total of 3,274 records. Valid @ 5 PM MST Friday, December 20, 2013. 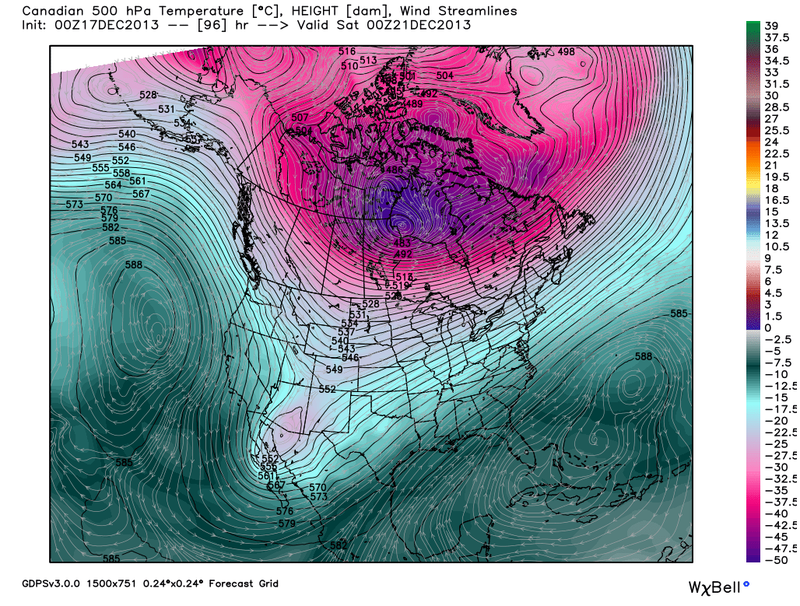 Last Nights 00Z/5 PM MST Canadian (GEM) 500 MB Forecast. I've waited several days before I updated my blog concerning our next winter storm. 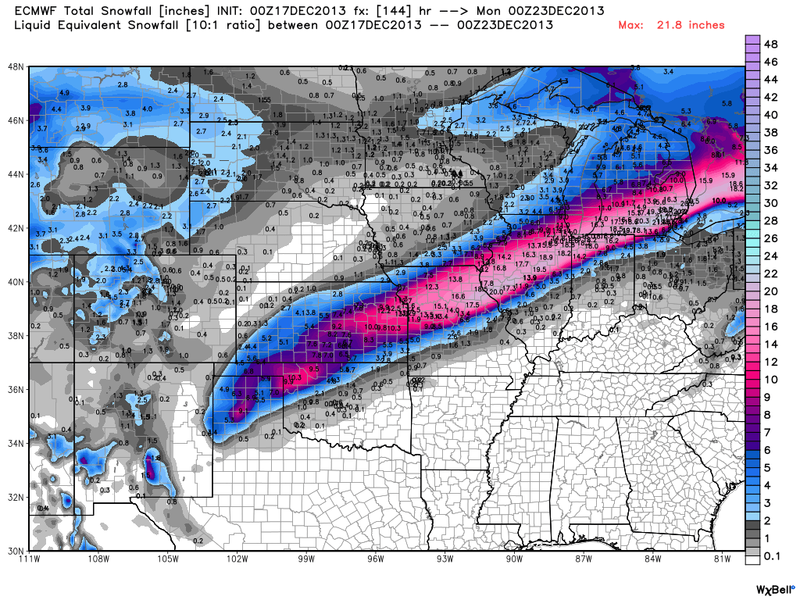 No doubt I probably could have waited a couple more because the models are still basically confused. At least concerning the details of how this storm will unfold, and what impacts it will have on New Mexico and our nearby neighbors. 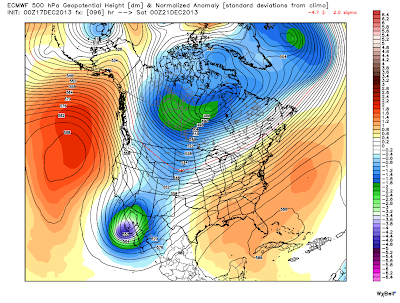 About the only thing they agree on this morning is that a fairly strong 500 millibar short wave will drop south out of the Pacific Northwest and into the Desert Southwest by Friday. 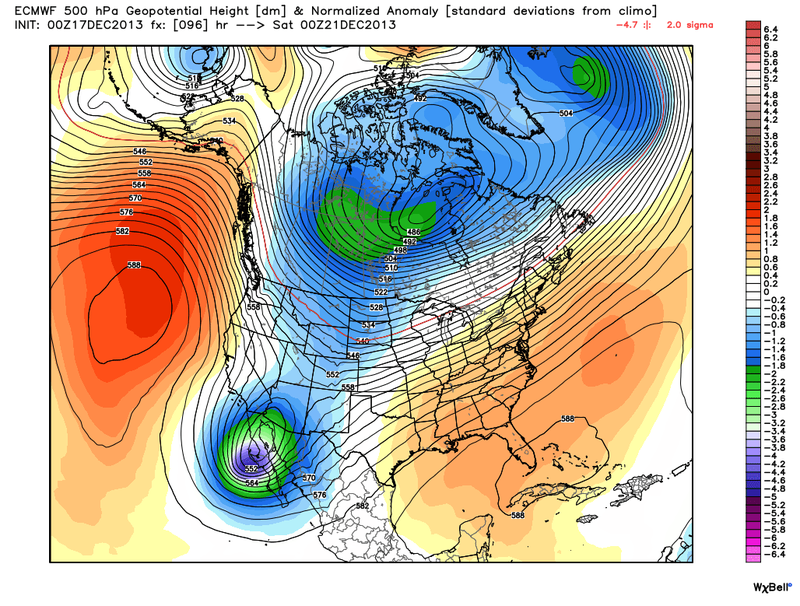 All three of the long-range models (above) are hinting at a closed low somewhere near the southwestern New Mexico boot-hill, or over northwestern Mexico by Friday. Last Nights 00Z/5 PM MST ECMWF 6-Hour Max Temp Forecast. 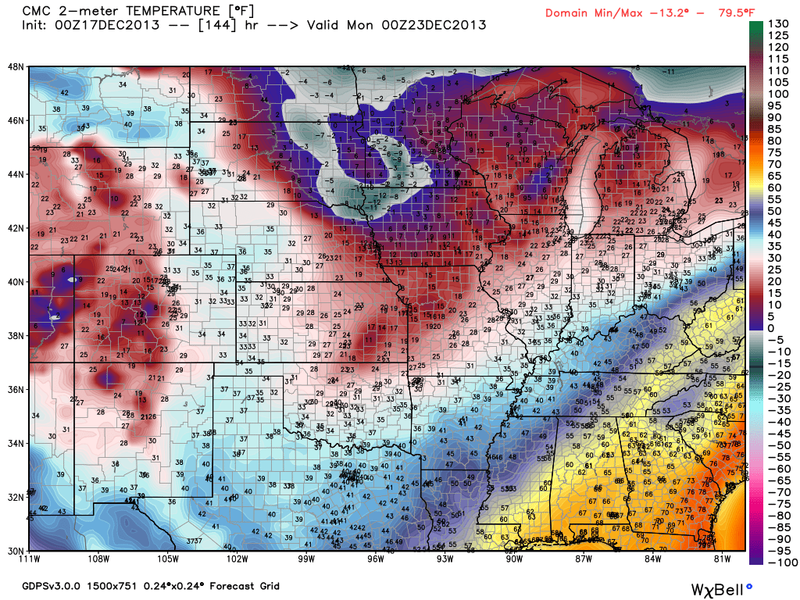 Valid @ 5 PM MST Sunday, December 22, 2013. Two weeks ago the models were depicting another significant surge of arctic/polar air to invade the U.S. east of the Rockies by this weekend. Now they've backed way off on that. A shot of arctic air will be headed south this week, but for now at least, it does not appear that this airmass will be as cold as first thought. 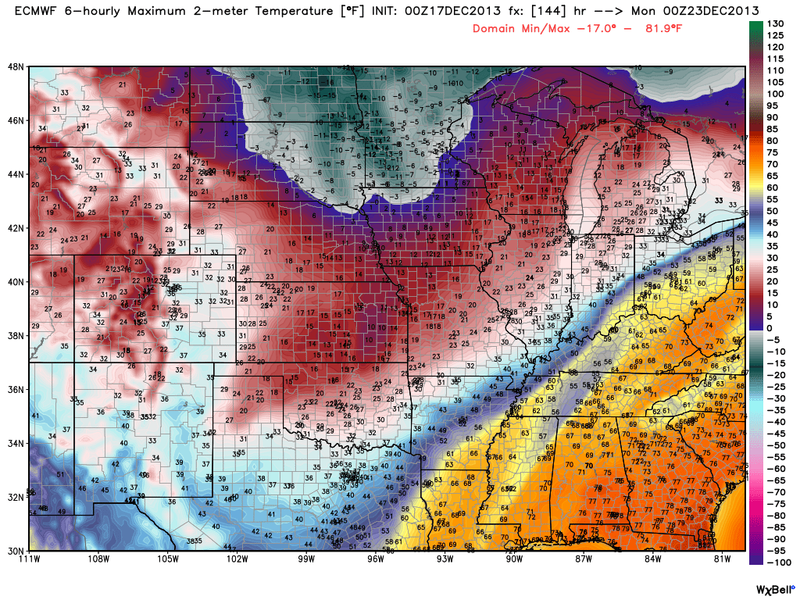 If the models are correct, this airmass won't be as cold as the last arctic intrusion. There remains some question as to when the colder air associated with the arctic cold front will arrive in southeastern New Mexico. This could be as early as Friday or as late as Saturday night or Sunday morning. Last Nights 00Z/5 PM MST ECMWF Total Precipitation Forecast. 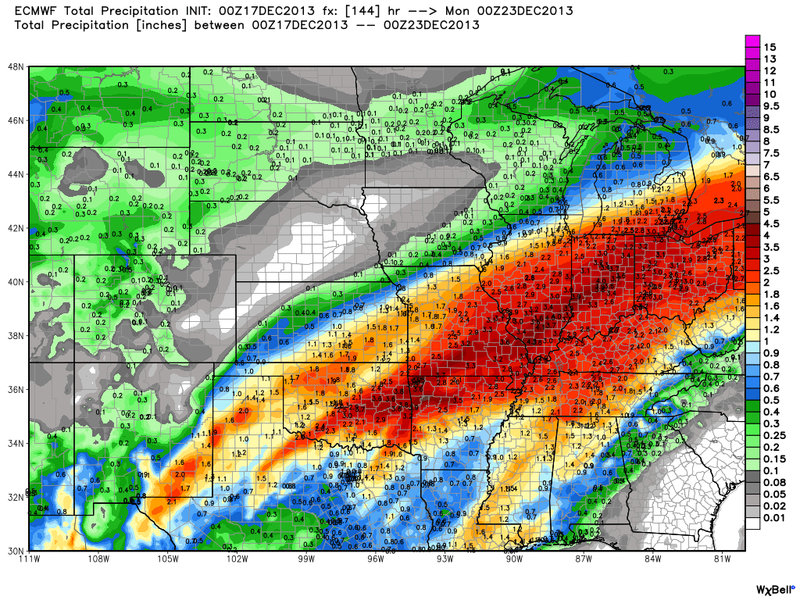 Last Nights 00Z/5 PM MST Canadian (GEM) Total Precipitation Forecast. 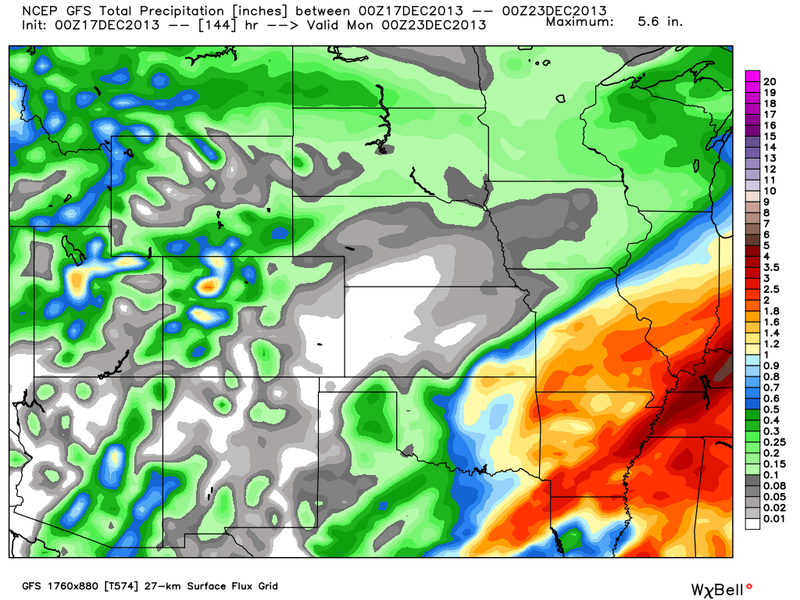 Last Nights 00Z/5 PM MST GFS Total Precipitation Forecast. 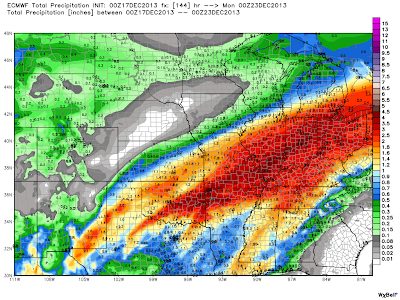 Last nights run of the European (ECMWF) model went nuts with its total precipitation forecast. Take a look at its forecast in the top map above...over 2" of rain for Artesia and Carlsbad by sunset Sunday. While the Canadian and GFS models basically leave us high and dry. So if the European (ECMWF) model turns out to be correct it would appear that southeastern New Mexico could end up with some heavy rainfall. Outside of the Sacramento mountains the heavier snows would fall over the Texas Panhandle and northeastward. Heavy rains of this magnitude in southeastern New Mexico in December are very rare indeed...so the odds of this happening are very low in my opinion. Which model is right? My answer to that question this morning is I'm not totally sold on any of them. I'm thinking we may have to wait another day or two before we get a better idea of what is going to happen here locally. Once the short wave energy drops into the Pacific Northwest, and we get a better sampling of the airmass associated with it...then I think the models will settle down some and the smoke will begin to clear. 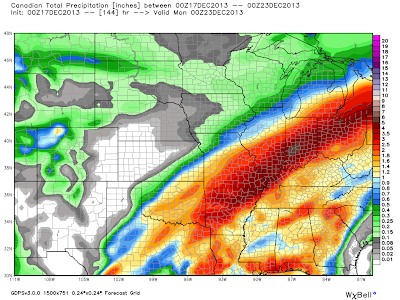 This could be one of those storms that has lots of surprises for us. It very well could end up having a much bigger and significantly harsher impact upon New Mexico's weather than current thinking indicates. Or it could also drop too far to the south to bring any of us much of anything. Although storms like this are very difficult to forecast...they are tons of fun to watch unfold. 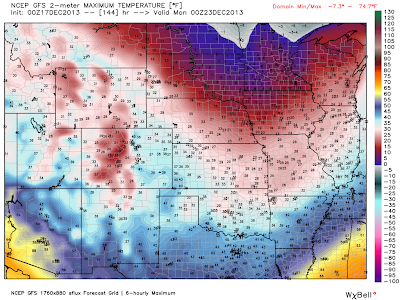 All of the model graphics above are courtesy of WeatherBell Analytics.